Carb lovers of the world, behold: October 25 is World Pasta Day. People have been eating pasta since at least 5,000 B.C. However, this delightful holiday was only established in 1995, when 40 pasta producers from around the world gathered to hold the globe’s first World Pasta Congress. Since then, the world has joined forces each October to pay tribute to one of the most delicious and versatile foods known to man. Whether you prefer rigatoni, angel hair, or pappardelle, you’ll love this holiday! If you love to cook, whip up a tastebud-pleasing pasta meal in your kitchen. Enlist the help of a few friends if you’d like company. For a quick dinner with easy clean-up, try a one-pan pasta recipe with tomato, basil, and mozzarella cheese. To celebrate an American classic, make some macaroni and cheese. If you’re in the mood to mix things up, make a Mediterranean pasta dish or tasty sesame soba noodles. If you want to nod to the traditional, try a recipe for cacio e pepe. The possibilities are endless! 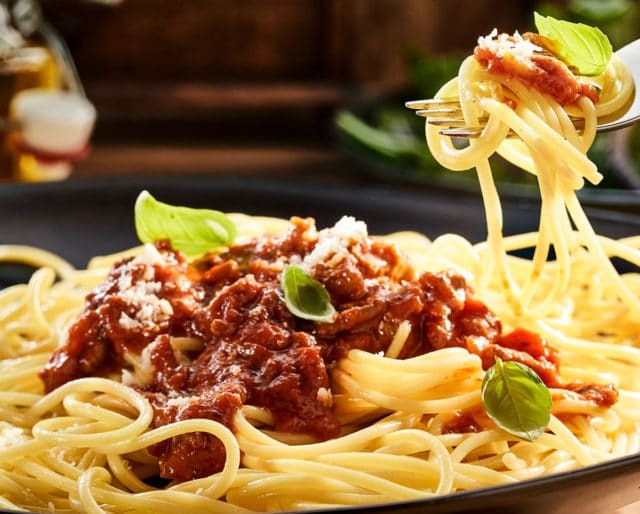 Each October 25, #WorldPastaDay lights up social media in celebration. (And let’s be real: since people love their pasta so much, the hashtag also shows up on Instagram and Twitter on lots of other days of the year.) Use the hashtag to show the world the carby creation you whipped up in your kitchen, or the pasta you ordered out in celebration. Grab your friends or family (or take yourself out for a nice solo date) and head to your favorite local pasta joint. Order a pasta dish you’ve never tried before, and enjoy every bite! No matter how lacking your kitchen skills may be, you can almost surely make yourself a bowl of pasta. All you need is a pot, a stovetop, and some hot water, and dinner is served. To make things even better, pasta is very affordable, which makes it great for your wallet when you’re broke. It’s also incredibly filling, so even if pasta weren’t so cheap to begin with, you’d still be getting tons of food for your money. Pasta (especially the whole grain variety) can help sustain energy throughout the day with its rich carbohydrate content. It also includes folic acid, and has a low glycemic index, which means it’s not likely to cause uncomfortable spikes in your blood sugar. In addition, it's a great way to squeeze in your daily suggested whole grain servings. Pasta is a perfect part of just about any lunch or dinner. (It can even make a great breakfast with a runny egg on top.) If you’re short on protein for the day, you can throw some chicken or fish in a pasta dish for dinner. If you haven’t gotten enough veggies, you can toss in some roasted broccoli and asparagus. If you’re looking to indulge, you can pour on some thick sauce, or if you want to keep things lighter, you can toss your noodles in some olive oil. The point is that there is a pasta dish to fit every mood and need. There’s also so much room for creativity in creating a pasta dish—your family may even have some special pasta recipes that are passed down to enjoy.